Hello! So, it’s getting quite close to Christmas now (a week! cue panic) so I thought I’d put together a wishlist of beauty products that I’ve got my eye on. I’ve already sent my Space NK list to my boyfriend, with a large hint about double points when it was on, so hopefully I might get a few pieces! Anyways, Urban Retreat Beautique is my new favourite website. As someone with a penchant for high end makeup and skincare, it’s a site that suits me down to the ground. They have a huge range of Nars and Laura Mercier and I’d love to get my hands on their Ambre Vanille set, as amber is my favourite scent. I got the Creme Brule candle last year in the sale and it’s amazing, so I’d love to add to my collection. I’ve always wanted to try products from Omorovicza (I’ve tried saying it out loud. Didn’t work) as I’ve seen the name pop up on blogs and the range seems amazing. Same with the famous Daniel Sandler blushes! Another site I’ve been browsing is Capital Hair & Beauty, which has a great variety of haircare, beauty and nail products. I’ve fallen in love with the above black metallic shade called ‘night sky’, which sounds like a very appropriate name. I’ve always wanted to try the Oatmeal and Honey range from TIGI, so I’ve definitely got my eye on that for adding moisture back into my hair! 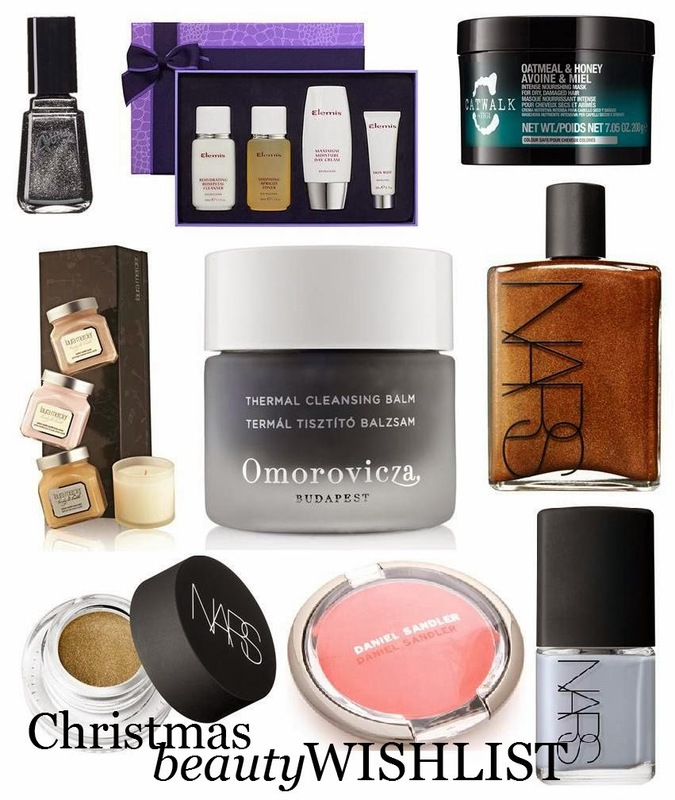 So, that’s my little wishlist of products I’d love to sample this Christmas. Even if I don’t find them in my xmas stocking, I’ll certainly be looking out for them in the sales! What products would you like for xmas? Any products you’d recommend? ps. check out these lovely blogs: Being Erica and Fashion Is Our Religion!